By sidelining Myanmar military abuses, India is failing to uphold a values-centered foreign policy. 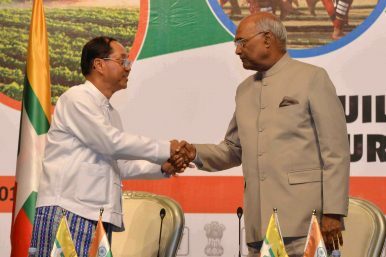 On December 14, India’s President Ramnath Kovind concluded his first state visit to Myanmar on invitation by his Burmese counterpart, President U Win Myint. A host of issues were discussed, including but not limited to bilateral cooperation on institutional capacity building, people-to-people relations, trade, infrastructure, cross-border connectivity, regional maritime security, humanitarian assistance, prevention of human and timber trafficking, and counterterrorism. Kovind also offered India’s appreciation to the Myanmar government for its attempts “toward achieving peace and national reconciliation” and expressed “full support” to the ongoing peace process with the various ethnic armed organizations (EAOs). Conspicuous in its absence was an emphasis on the Rohingya crisis, and the urgent need for accountability from the Tatmadaw (Myanmar’s military), which stands accused of committing genocide against the Muslim minority community in northern Rakhine. Following an attack by Rohingya insurgents on security installations in August 2017, Myanmar forces launched a series of violent “clearance operations” in Rakhine, leading to the deaths of at least 10,000 Rohingya and forced displacement of more than 800,000 to neighboring Bangladesh. In line with India’s earlier official iterations on the Rohingya situation (including the refugee crisis), the joint statement posits a stance that is not only uncritical of the prevailing situation, but also completely devoid of assertions on human rights and justice. India continues to hammer on the complexity of the crisis but refuses to unpack it. New Delhi also continues to avoid using the term “Rohingya” in an obvious attempt to not inflame Naypyitaw. “India expressed its support for the agreements reached between Myanmar and Bangladesh for the repatriation of the verified displaced persons from Rakhine State and underlined its readiness to continue to assist in addressing this complex issue,” the joint statement reads. This is a short-sighted and context-insensitive view that completely misses the ground realities of refugee repatriation. While the bilateral repatriation arrangement between Dhaka and Naypyitaw is a positive sign of political willingness to return the displaced Rohingya to their original homes, the negative circumstances on the ground in Rakhine state severely hinder the deal’s implementation. In fact, it was only last month that Bangladesh suspended the proposed repatriation of an initial batch of 2,200 Rohingya refugees after vehement protests by the refugees themselves. The return process now stands postponed indefinitely. In a situation where the refugees have clearly expressed their unwillingness to go back to Rakhine, where conditions remain rife for anti-Rohingya violence and resultant redisplacement, the bilateral agreement between Myanmar and Bangladesh needs fundamental revisions. Without ensuring full dignity, safety, and sustainability of return, which would include demanding accountability from political and military actors in Myanmar and establishing a multi-stakeholder mechanism for consultation, repatriation will continue to be a futile, anti-refugee process. India’s joint statement with Myanmar fails to even flag these points, leave aside demanding a timely resolution. It only harps on about the developmental assistance that New Delhi has given to Myanmar for “infrastructure development [in Rakhine state] under the aegis of the Rakhine State Development Program,” including the formal handover by India of 50 units of prefabricated houses in Rakhine and assistance within the agricultural and IT sectors in the strife-torn state. Yet again, this is a linear approach that overlooks critical aspects of conflict-sensitive development. Myanmar’s development program in Rakhine State may not be as benign as it appears. In March this year, Amnesty International published a report that described how the Myanmar authorities were bulldozing Rohingya villages that were earlier razed to the ground by the military and are now building new security installations and roads on top. These, according to the report titled Remaking Rakhine State, are being done under the ambit of the Rakhine State Development Program. Further, Myanmar has been constructing several “transit camps” to process the returning Rohingya. But the UN believes that these camps could be used to intern the Rohingya on a long-term basis. If history is any indication, the UN’s apprehensions are well founded. India continues to blatantly ignore these developments and the critical context. Clearly, much like Myanmar itself, it believes that simply injecting material and financial aid into Rakhine state would resolve the Rohingya situation, which in reality has its roots in hostile political and institutional attitudes of the Burmese state toward the stateless Muslim minority community. More worryingly, New Delhi continues to conveniently avoid raising its voice on allegations accusing the Tatmadaw of war crimes and crimes against humanity. Despite clear accusations of genocide against the Tatmadaw by a UN Independent International Fact-Finding Mission and an ongoing investigation by the International Criminal Court, India has avoided raising the human rights issue with Myanmar in public statements and forums. In this, New Delhi has maintained a similar tone to that of China, which has firmly supported and shielded Myanmar from punitive actions in international forums, including the UN Security Council. This is particularly unsettling because right at the beginning of Kovind’s trip, Burma Campaign UK (BCUK) released a “dirty list” of international companies doing business with the Tatmadaw or Tatmadaw-owned holdings in Myanmar whose “operations are linked to human rights violations or environmental destruction.” This, according to BCUK, renders these companies “complicit in the human rights violations committed by [the Tatmadaw].” Most of these companies are Chinese entities. However, three Indian companies — Hindustan Aeronautics Limited (HAL), Infosys, and the Tata Group/Tata Sons — feature in the list. According to the BCUK’s investigations, while HAL is poised to sell a new training aircraft, HTT-40, to the Myanmar military starting next year, the Tata Group supplies logistical equipment to the Tatmadaw, including the LPTA 715 troop carrier and the Xenon GS800 SUV. What is more, during Kovind’s visit, the Republican-controlled U.S. House of Representatives passed a resolution with a 394-1 majority labeling the Tatmadaw’s violence against the Rohingya as “genocide.” This was an unusual move that signals the disagreement of a majority of Republican lawmakers with their own president, who continues to avoid using the term. The least that the visiting Indian president could have done is extend a call to bring accountability for Myanmar’s military actions against the Rohingya by impartially probing the serious allegations of war crimes. Myanmar has already established an Independent Inquiry Commission to look into the abuses. For India, an official assertion in the joint statement to strengthen the same and take the ongoing investigation to its logical conclusion could have been both diplomatic and morally responsible. But India’s position on Myanmar remains locked in hardset foreign policy compulsions that do not allow for moral concerns to take over the bilateral. Myanmar features squarely in the heart of India’s Act East Policy, primarily as a geostrategic land bridge to Southeast Asia. In this context, New Delhi does not wish to isolate Naypyitaw in any manner, least of all by invoking the hypersensitive Rohingya issue. Besides, for India, the prerogative is to keep itself relevant in a country that is being increasingly drawn into the Chinese sphere of influence. More crucially, the Indian defense establishment shares a special relationship with its Burmese counterpart. Over the past one year, the Indian army has laid out the red carpet for the Tatmadaw’s senior leadership in multiple forums, both bilateral and multilateral. As a key security ally in the region and arms supplier, the Indian armed forces remain committed to maintaining a fine working relationship with the tainted Tatmadaw. All of these make it amply clear why India has maintained radio silence over the unimaginable human rights abuses that have taken place right on its doorstep. But, no amount of diplomatic realism can justify this regressive silence. Much of how India responds to the Rohingya situation will determine its foreign policy template for a long time to come. While countering an assertive China is a legitimate prerogative for New Delhi, a strategic neighborhood policy should not come at the cost of forgoing a foreign policy that accords due agency to human rights concerns and institutional accountability, especially when faced with accusations of genocide. Angshuman Choudhury is a Senior Researcher and Coordinator of the Southeast Asia Research Program at the Institute of Peace and Conflict Studies, New Delhi.